Joan Allen started at UConn in 2005 by working with plants that were out of this world. These days, her job is more down-to-earth. Throughout her time here, she continues to enjoy the variety. “I learn something new all the time,” Allen said. When she first came to the College as a research assistant, Allen studied plant physiology at hypergravity using centrifuges at a NASA research facility. These experiments duplicated earlier ones done in outer space. Currently, as an assistant extension educator, Allen diagnoses earthly insect and plant disease problems for home gardeners and people who work in agriculture. Her base of operations in this world is a diagnostic lab at PSLA’s Home and Garden Education Center. 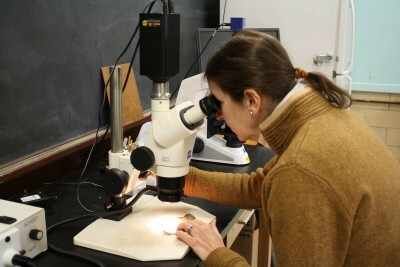 Much of Allen’s time in the lab is spent examining plant samples brought to the Center and lab by UConn integrated pest management (IPM) personnel. The IPM team obtains the samples as part of their work in advising commercial vegetable and fruit growers, greenhouse and nursery operators and Christmas tree growers. In addition, professional clients and homeowners submit samples directly to the lab in person and via postal mail.